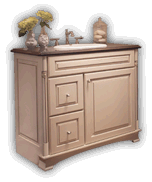 Design a beautiful bath that truly reflects your personality with KraftMaid® cabinetry and countertops. Whether you're creating a Master Suite, Hallway Bathroom or Powder Room, KraftMaid offers endless possibilities. Create a fully coordinated look throughout your bath with our uniquely designed accent collections. Console vanities offer high-quality furniture styling that can be customized with five leg options, a roll-out tray and any KraftMaid door style and finish color. Our 5-step process will walk you through how to find your style, plan the space, find professionals in your area, prep for the remodel, and more. Explore solutions specifically designed to maximize space in your bath. Browse our photo gallery of gorgeous bathrooms for ideas to inspire your bath design. Create your own account and start saving things that inspire you to your Wish List.